I’m off on another trip to England with another chance to experience Premium Economy with Virgin Atlantic. There are many different airlines you can choose to fly, but when you find one you like, you tend to use them over and over. That’s the case with me and Virgin Atlantic. 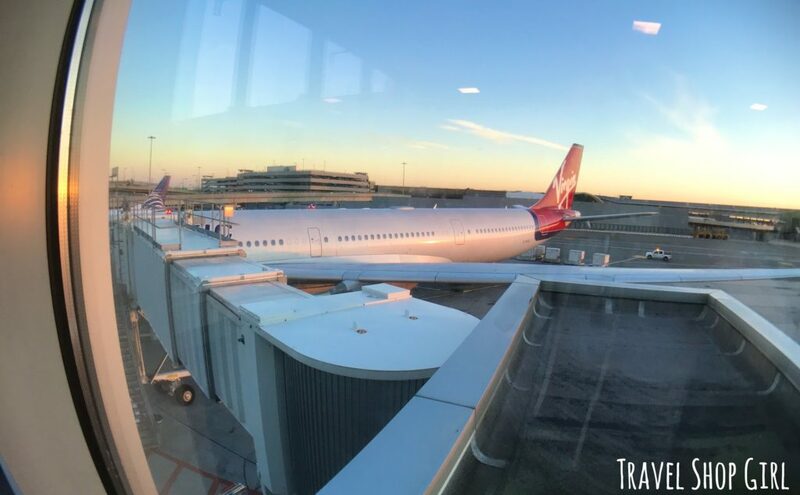 This time, I had an early Saturday morning flight on Virgin Atlantic‘s codeshare partner, Delta. 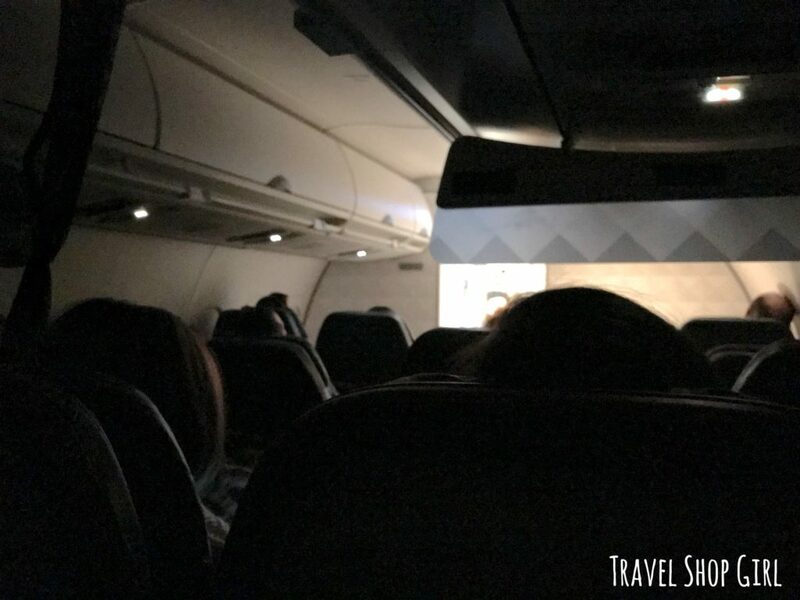 My flight was out of Boston Logan International Airport with a connection through JFK Airport in New York and I was stressing. Would I arrive on time for my connection? Should I check my bag? So much to worry about and never enough time to make the right decision. My flight was scheduled to leave Boston at 6 am and arrive in New York at 7 am in Terminal 2. I then had to get to Terminal 4 for my 8:15 am international flight along with my bag. That’s right – I was going to check a bag. Something I hate doing and try never to do. However, Virgin Atlantic‘s cabin allowance is quite strict. While they allow up to 50 lbs. for checked baggage, their hand baggage is much smaller. Passengers in Premium Economy are allowed one 22 lb. bag that measures approximately 9 x 14 x 22 inches. My bag was the proper dimensions, but weighed about 30 lbs., which meant checking my bag. My fear was that either I or my bag wouldn’t make the flight to London. I was up early at 3 am getting ready and out the door at 4:15 am to join all of the other crazy people who decided to get up early for flights. Believe me, there were far more than I ever expected at that time of day. The flight boarded without issue and we were soon off to New York. Strangely enough, the lights stayed off and the shades were closed for the duration of the flight. This wasn’t an overnight flight so I wasn’t sure why it had to be so dark. Once off the plane, I immediately followed the signs for the Terminal 4 shuttle stop for the JFK Jitney. 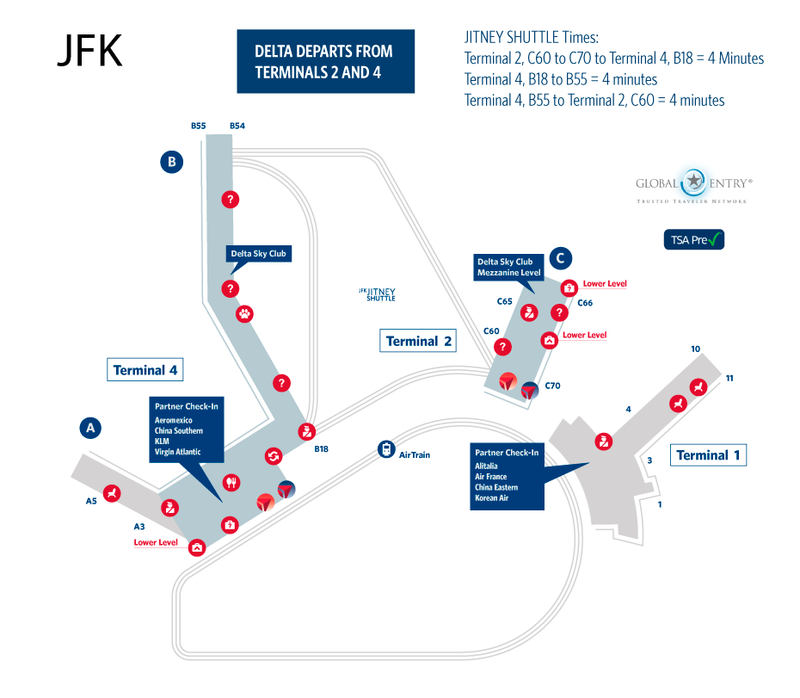 By taking the JFK Jitney instead of the AirTrain, you don’t leave the secure side of the airport and have to deal with going through security again. I didn’t need to stress as the JFK Jitney was easy to locate and took all of a few minutes to make its way over to gate B18. From there, I just had to walk a short distance over to gate A5. We arrived at the gate and didn’t have to wait at all to board. We showed our boarding passes and passports and we were able to walk down the ramp toward the plane. 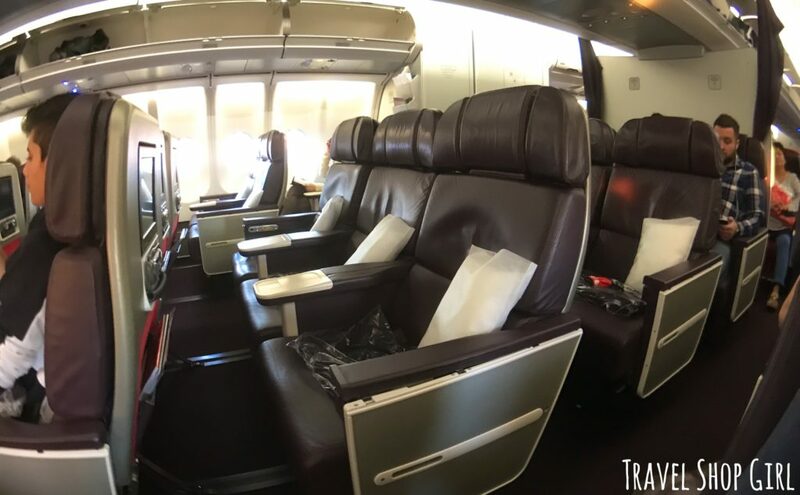 I was so excited to experience Premium Economy again on Virgin Atlantic, I could hardly contain myself. Walking over to the plane I noticed that the ramp was enclosed in glass. I couldn’t help but be that person who has to stop and take pictures. But how could I pass up taking a picture of the plane I was about to fly on? 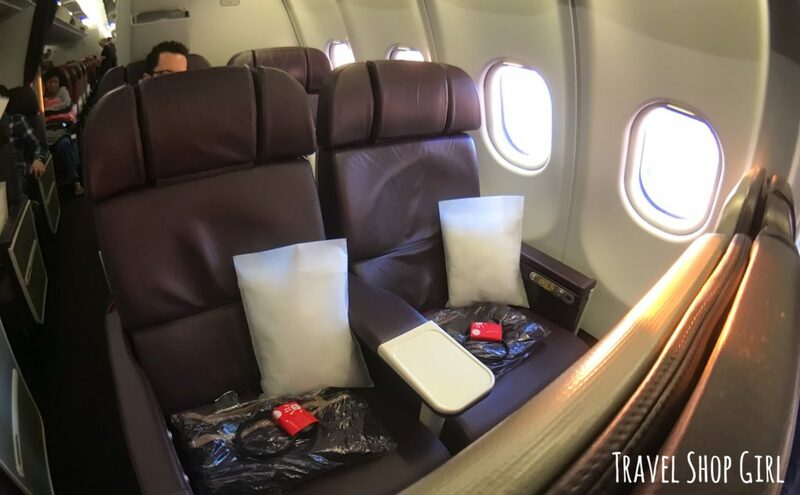 The last time I flew Virgin Atlantic Premium Economy, I was squeezed into the middle section of the plane in seat D.
This time I had a window seat in the 2 x 3 x 2 configuration of the Airbus A340-600. 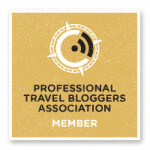 If you experience Premium Economy more than once, is it the same experience? Definitely not. 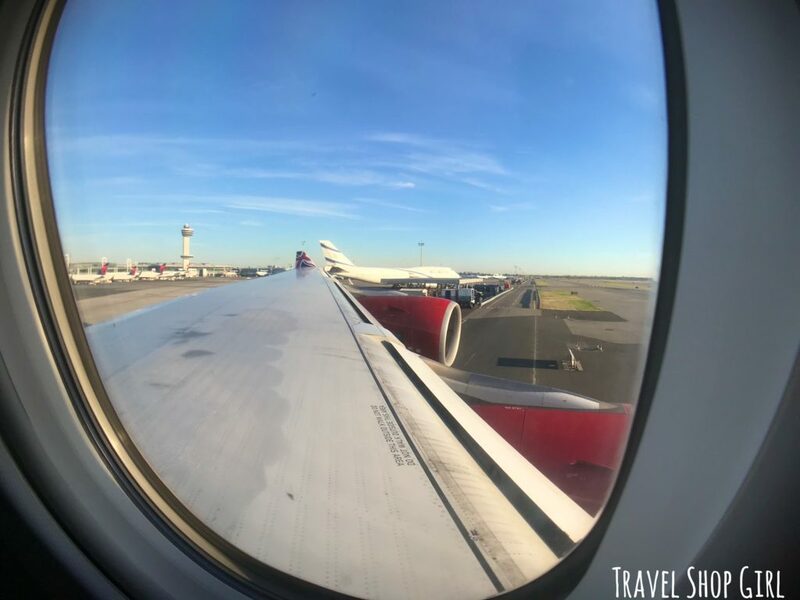 Sitting in a window seat next to Mr. TSG, I definitely had more privacy and totally believe this is how to experience Premium Economy on Virgin Atlantic. The seats are wider than Economy (21″ vs. 17.5″) and the pitch, or distance between the seats, is 38″ vs. 31″ in Economy. The old, dated seat back entertainment console and controller might be archaic, but who cares? In reality, it could be far worse. You could get stuck without any entertainment altogether like what some of the budget airlines provide. In the end, I’m happy to have pretty much anything as a distraction. This is a view of the center seats D, F, G and across the aisle to seats H, K. The seats themselves aren’t the issue, but the armrest in this section is rigid. If you’re traveling alone, sitting so close to a stranger is definitely uncomfortable. 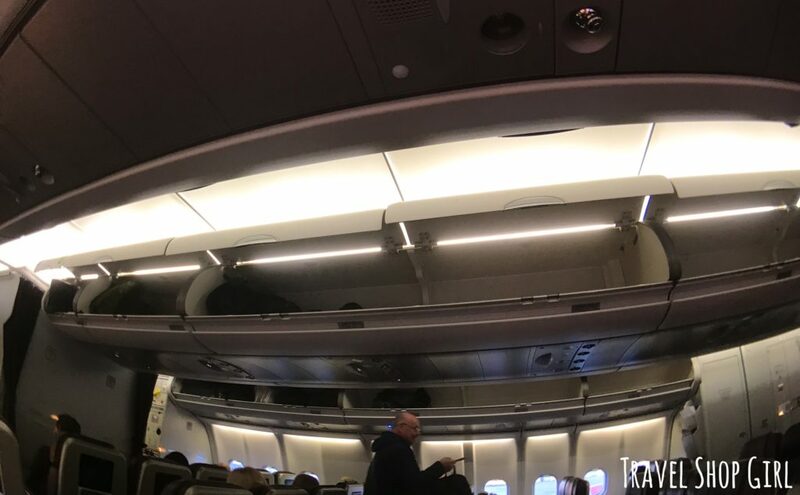 The overhead bins/lockers in Premium Economy are quite large and spacious. As such, that meant no problems getting our small bags inside with plenty of room to spare. Before takeoff, the flight attendants came by with a choice of orange juice or bubbly for us. Of course, I had to take the bubbly even though it wasn’t even 8 am. 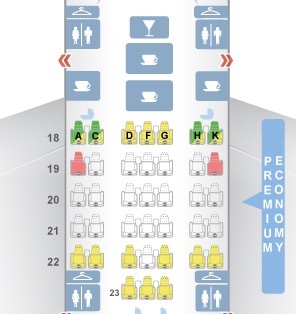 How else was I going to fully experience Premium Economy? I took one quick pic as we started our departure out of JFK to London. There’s nothing better than the beginning of a new trip. Our flight was scheduled to depart at 8:15 am and arrive at London Heathrow (LHR) at 8:28 pm. Our flight departed on time, which is always a bonus at the start of any trip. The flight attendants provided us both dining menus even though we had ordered special meals. As for me, I had the vegan meal and Mr. TSG ordered the vegetarian meal. But I still like to look over the menu, experience Premium Economy to the max, and pretend I can order right off the menu. 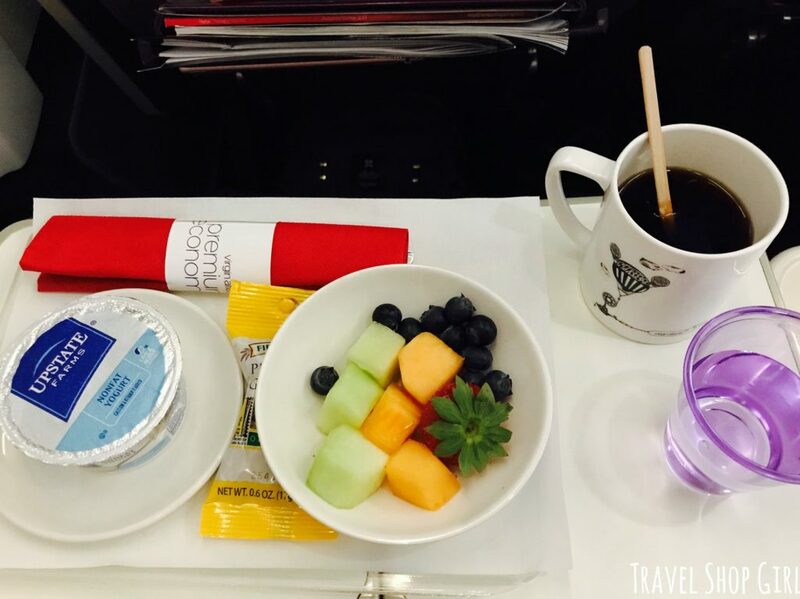 Since this was a day flight, our first meal onboard was breakfast tray. Unfortunately for me, I don’t think Virgin Atlantic understands what a vegan is (no meat, fish, eggs, and definitely no dairy) as my tray included yogurt and there wasn’t any non-dairy creamer on board the flight. I gave Mr. TSG the extra yogurt and I ate my fruit and tried to drink my coffee black alongside some water. Not so tasty, especially with the packet of granola provided to mix into the yogurt. The purser (flight supervisor) announced at the beginning of the flight that there was a person on the flight with a nut allergy, including issues with airborne nuts or nut dust. That meant no nuts could be consumed on the flight. Of course, I had brought along some nuts and protein bars with nuts to supplement any paltry in-flight meals and now that was a no go. 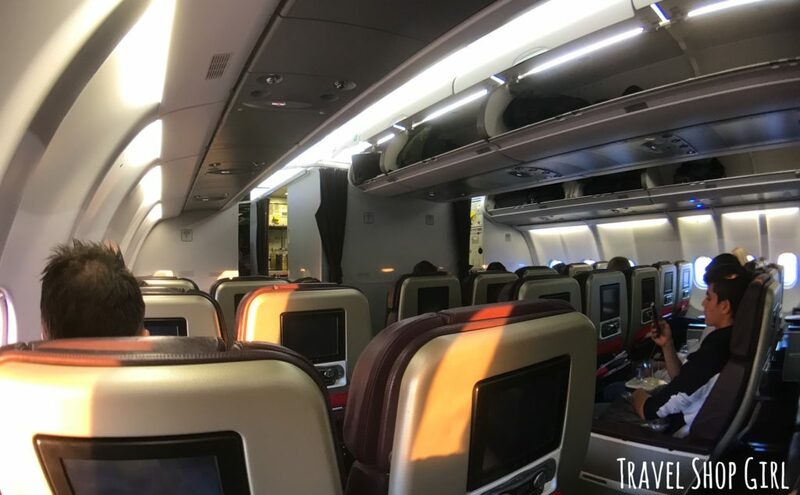 I tried not to let it bother me as I had nearly 7 1/2 hours to experience Premium Economy, including highs and lows, and wasn’t about to let this be an issue. I decided to sit back, watch a movie or two, and relax. Before I knew it, a few hours had passed and dinner service had commenced. My special vegan meal tray arrived, which included two salads and one entree. Mr. TSG received the salad with mozzarella along with the bread and enjoyed having duplicates on his tray. My vegan entree was some kind of rolled eggplant with stuffing. But for the life of me I can’t tell you what was inside. It was filling, but I have no idea what was inside. Was it lentils? Walnuts? As long as it was vegan, I’m ok with not knowing what it was. Also on the tray was a small salad and fruit for dessert. I can honestly say that I definitely had more than enough to eat. Mr. TSG’s vegetarian meal included cheese and crackers, stuffed shells, now two tomato and mozzarella salads, bread and butter, and for dessert, an almond chocolate dome. Pair that with some wine, red or white, and while not 5-star restaurant quality, it’s definitely a pretty decent meal. He ate it all and had little to complain about, which is pretty good for airline food. After passing through Immigration Control at Heathrow, we made our way to baggage claim. I stood by our belt and watched people come and go for some time before starting to think something might be wrong. I even left Mr. TSG to look for the bag so I could use the restroom to freshen up. 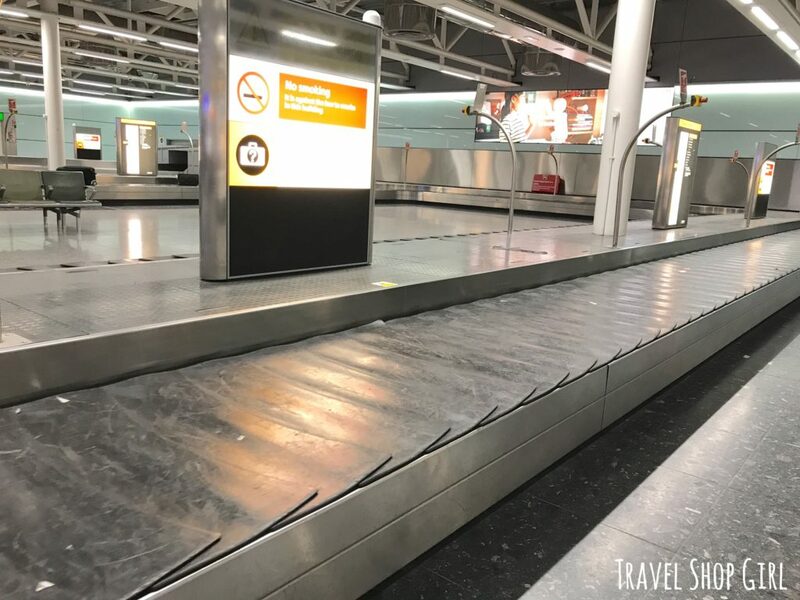 When I returned, the baggage claim belt for our flight looked like this. That’s when I really knew something was wrong. Virgin Atlantic has a missing or delayed luggage counter nearby in baggage claims so we walked a few steps over to it and waited in the queue. 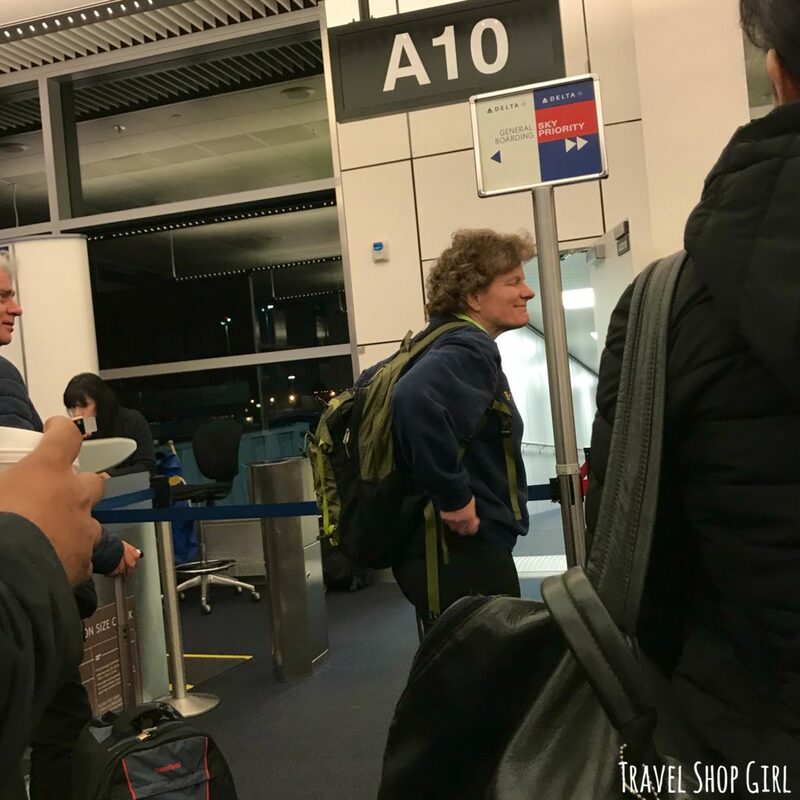 When it was my turn, I began to explain my situation while Mr. TSG noticed a list with our names and about six other passengers on it. Turns out there were several bags that didn’t make it on the flight from New York. We were going to be in London without our bags for at least the night. First we were told they’d be there in the morning, then noon, and then I was just hoping I’d get them. I had no clothing, toiletries, and nothing in my small carry on bag but my ghost hunting equipment. I know that sounds crazy, but I didn’t want to pack my cameras and other delicate equipment inside a checked bag. That meant my toiletries and clothing were in my checked bag and sitting in NYC instead of with me. 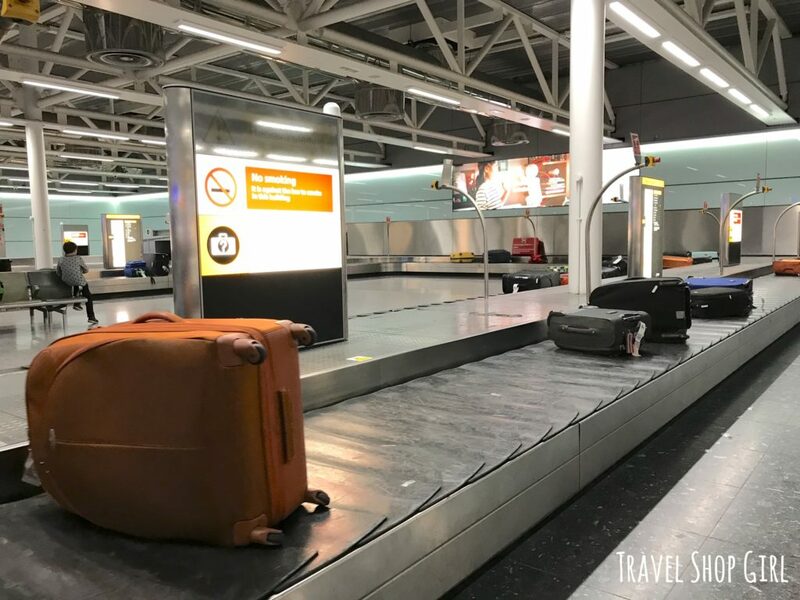 Should you end up with a delayed bag, make sure to connect with the airline at the airport and show them your boarding pass and baggage claim tags. They will need this information in order to file a report. 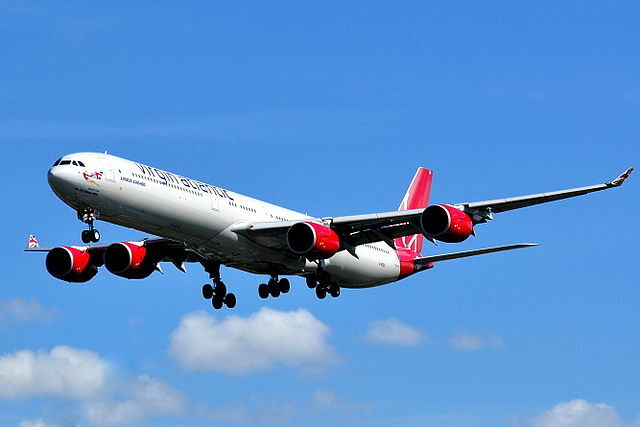 Virgin Atlantic will create a Property Irregularity Report (PIR) before you leave the airport and provide you with the PIR number as well as a telephone number and websites to track your baggage. The End Result. Good or Bad? Our bags showed up at my hotel the following day at 6 pm. In the interim, we ended up shopping at Boots for toiletries and H&M for some clothes. 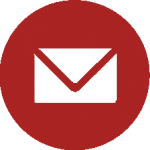 When I returned home, I filed a claim for reimbursement on November 8 and on November 10 I received a response. 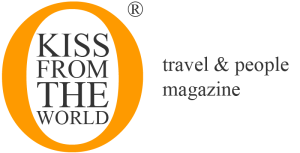 The claim was approved and Virgin Atlantic is scheduled to disperse the money to me within 10 working days. That’s what I call incredible service from any business, especially an airline. Originally I was a little burned by having my luggage disappear, but I’m so pleased with their service and how they resolved the overall situation. How often do you get excited about flying? I certainly do when I get a chance to fly with Virgin Atlantic. This opportunity to experience Premium Economy again in a different section of the cabin made me appreciate it more. While it’s not Upper Class, it’s not Economy, and for a little more money I enjoyed more legroom and comfort. Without a doubt, Virgin Atlantic is probably my favorite airline to fly with and I hope to fly again with them real soon. 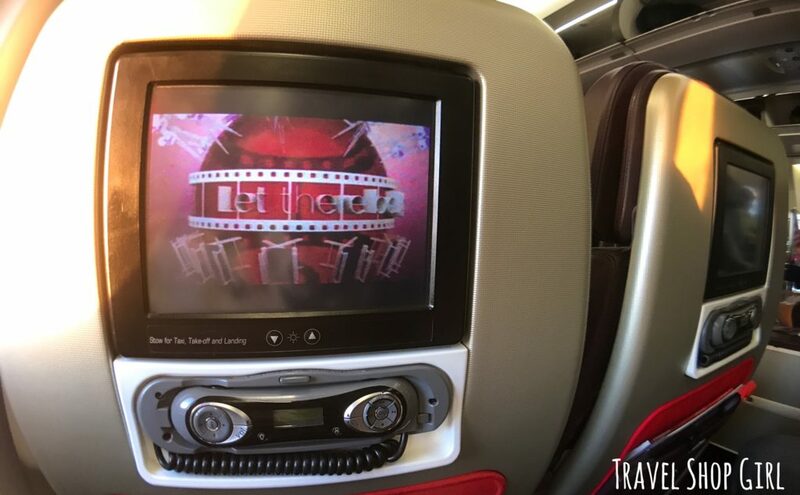 Have you tried to experience Premium Economy on Virgin Atlantic yet? Why or why not? 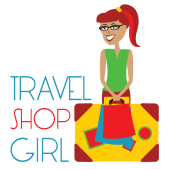 Discover some of the other airline reviews on the Travel Shop Girl website while you’re here. 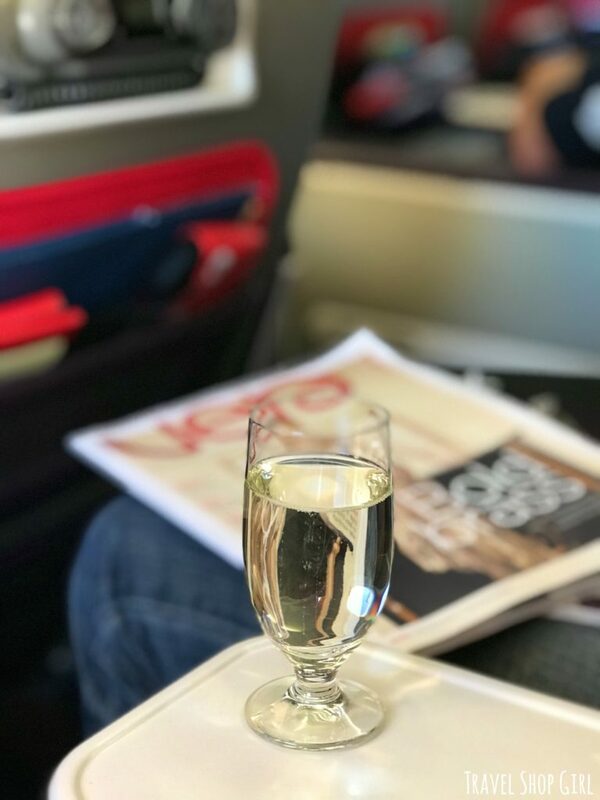 On my new SPONTANEOUS TRAVEL SCALE of 1-5, with 1 being super easy and spontaneous and 5 being you better plan far in advance, any chance to experience Premium Economy on Virgin Atlantic is a 1. Granted, the later you wait to book, the higher the price will be for your ticket, but still. 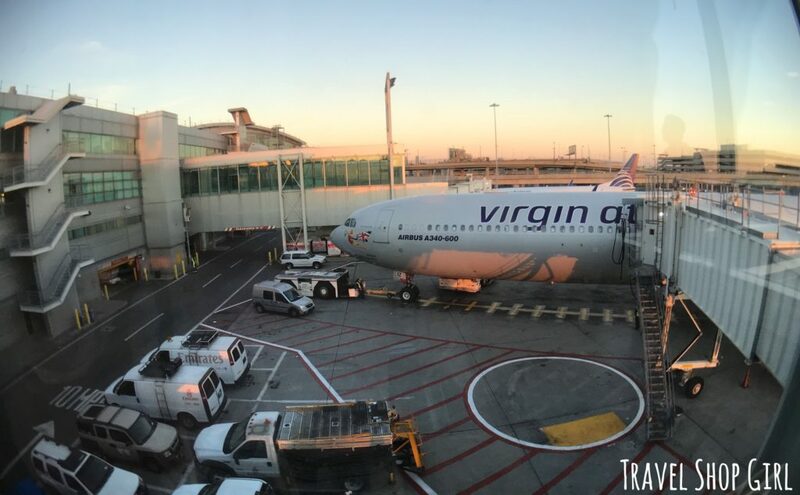 I’m giving Virgin Atlantic Premium Economy a thumbs up as far as spontaneous travel goes.